We presented the first results of our case study in Amersfoort at the Sharing Event organised by the URBACT Secretariat, on the evening of the 8 October 2014 !The event took place in the former wine cellar, now host to an organic market, to start ups, social economy experimentation and various types of events (including weddings ) – la Halles des Tanneurs, in the still very Brusseleir neighbourhood of Brussels. The objective of the event was to bring in participants of the Open days going on through the whole week in order to present them with the results of our workstreams, but also to entertain them. The master word was therefore to have fun and relax ! All this while enjoying the inputs from the capitalisation process. So, how did the evening proceed ? Accompanied with chamber music, we started with appetizers : each of the workstreams have 2 minutes for a pitch on the main course it was provided. 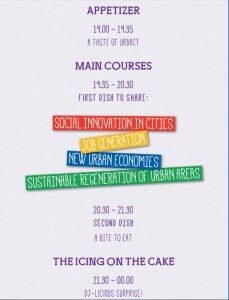 We then « animated » our main course, which was prolonged with discussions with the participants. We ended up the evening with a burst of energy on the dance floor. During our « main course » we organised a living exhibition. 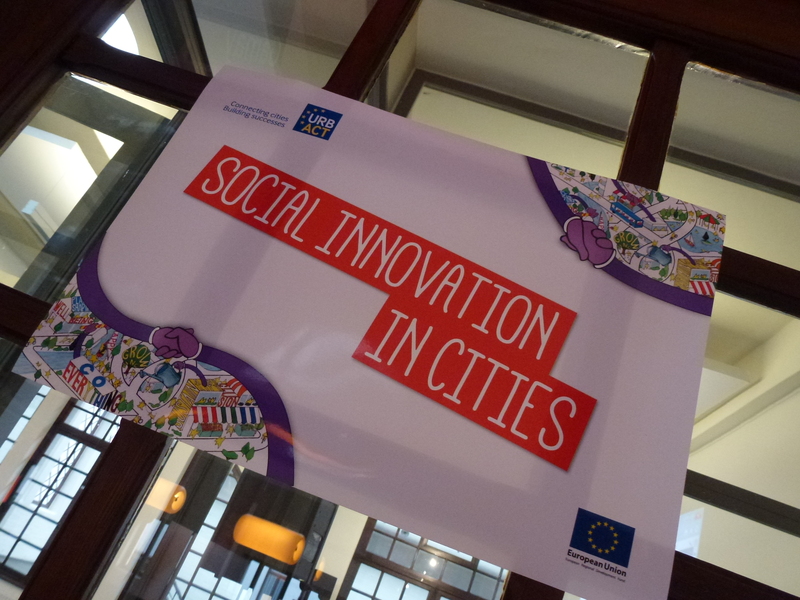 The principle was straightforward and participatory : we presented some statements from people encountered during our visit to Amersfoort – relating to the integration of social innovation in city governance, as well as pictures of key projects, on paper boards. We presented each of these boards to the audience. 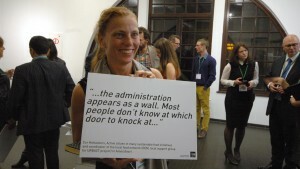 There were then two rules : the participants were asked not to wait for the end of a point/case presentation to discuss it with their neighbours and when they started being annoyed to hold an exhibition board, they were asked not to leave it on the floor but to pass it to someone else, explaining it. With this experience, we intended to picture a process of social innovation building on human factor, self-organization, people empowerment, trust and mutual help. Also, we sought to make practitioners and experts experience the way we could enable social innovation … or as in our case – to make a ‘living ears-to-mouth exhibition’ with all the passing participants. At first, the participants entered shyly in the room, standing and waiting for something to happen. Maybe some were just coming to collect the red sticker that would enable them to get a gift at the end of the evening ! 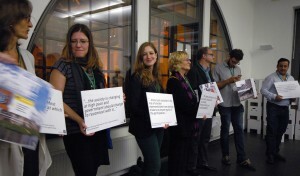 The boards were distributed one after the other, and the participants were holding them. Slowly, the started exchanging them, giving them to newcomers. Those arriving after the beginning seemed stumbled but got into the rhythm and in the end, filled the entire room, everybody holding one of the 33 boards. 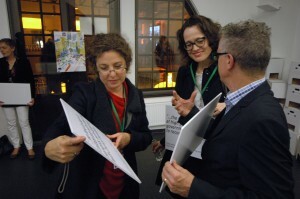 The discussions really kicked off at the end of the presentation when the participants exchanged on their own experiences, brought in new insights, distributed business cards (networking was part of the objectives of the evening!) and stayed until deserts in the room. This living exhibition really made the story of Amersfoort concrete and accessible, linking to other experiences and leading to the wish to investigate it even more ! We shall present the results from this case study as well as that o f the visit to Gdansk during our final meeting on 28 October in Brussels. Do not hesitate ot inform us if you would like to join and hear more about our case or even the methodology !